In 2003, the USA, UK and sundry allies invaded Iraq on the pretext of bringing democracy, while simultaneously supporting regimes throughout the Near and Middle East that wouldn’t know democracy if they buggered it with an electric cattle prod. And they did. 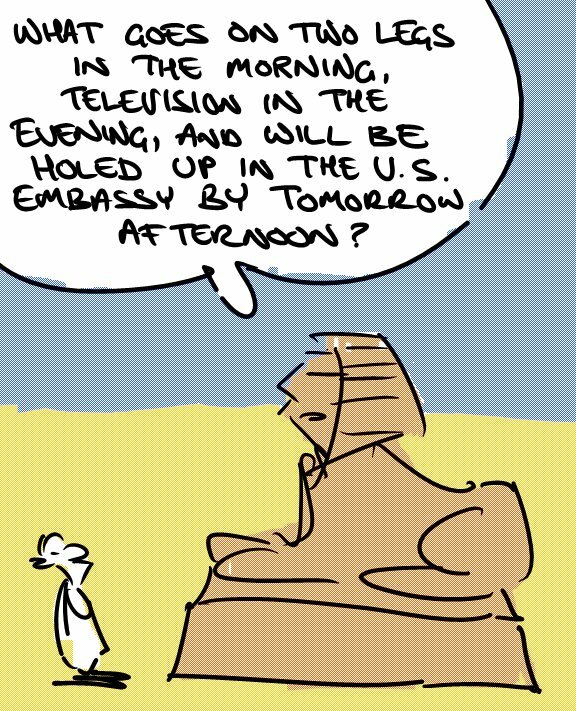 Egypt was one such of course. The West had been happy to turn a blind eye to this during the Cold War because previously Egypt had been getting awful close to Russia. Better it be one of our oppressive failed states, right? That stopped making sense after the fall of Communism, but Egypt was somehow converted into a bulwark against revolutionary Islam. Hell, dictatorship is pretty much a bulwark against any sort of change, right? And change is scary. Scary is bad, so therefore dictatorship is good. The logic is watertight. Mad, but watertight. What we are seeing today in Egypt and across the region is a movement comparable, in both scale and moral significance, to the revolutions of 1989 in Eastern Europe. Social media told the people what the conventional media was forbidden to tell: That they were many, and the government’s minions were few. If we ever needed an argument against allowing censorship of the Internet, there it is. These people who are angry in Egypt are people like us. They have Twitter accounts. They’re on Facebook. Our governments may have colluded with their government in the past, but we must tell our governments to stop being stupid. You can’t bomb people into freedom. Freedom rises upwards. We are either on the side of freedom or we’re on the side of oppression. In Egypt right now, Christians are standing guard to protect Muslim protesters at Friday prayer from the police. Check out #Egypt on Twitter. Express your solidarity.